Bishop should go. Good idea! I've quit these forums for a while, but after the Prometheus went out and now with Aliens:Colonial Marines visible on the horizon, I decided to come back here and see what is up. With all the fannames that are been used, both old and new ones, I found it somewhat... confusing to read threads and sometimes have no idea what people are referring to. Some things I remember from the "back in the days", others I've forgotten. So, I decided to make this "Fan Dictionary", seen as I did not found something similar around. Just remembering how hard it was for me to follow discussions when I first joined, I'm sure you will agree. The "AvPGalaxy's Fan Dictionary" is an easy-to-follow dictionary of definitions of names that people have given to various stuff from the movies and are often used on this very and other sites. Almost all of the names/words that you will find here are made by fans and fans (production crew). Meaning that they are never sad in the movies. Perhaps in special commentaries, comics, games, but never in the movies. Meaning that it's not allways enough to just have watched the films to understand them. Some of the words can be figured out by their very sound, others are a bit more tricky. And that's where this dictionary plays its hand. 1. The words that are been described are italicized. 2. Their definition and origin have underlines. 3. The definition gives away the nature of the object while its origin tries to put some logic behind it. 4. There will allways be two letters in caps to the left of an object. (MR) means "movie reference", since the name clearly refers to a movie, while (FR) means "fan reference", something that relates to discussion on these boards and have nothing to do with the franchise cinema (that includes games aswell, since it is a general consensus that games are not a part of the official canon, well, at least not untill A:CM comes out and proves us wrong (which it didn't, now that it's out)). Definition: The main predator from "Predator". Origin: After killing Mac the predator whispers "Anytime" to Dillon. Definition: One of the three main antagonists predators in "Predators", the one that fights Royce in the end. Also referred to as "Mr. Black". Origin: I guess it looks like he rage a lot. Definition: This one is quiet tricky to explain, but what it really means is which parts of the Alien/Predator/Alien vs Predator universe you accept as truth/legit. For example Ridley Scott doesn't consider AvP movies "canon" to alien films and therefore might not have any connection with them in his newer films or even outright contradict them. It is your choice as a human being to consider parts of this franchise as "truth" and others not. And that "truth" is your canon. Origin: Unknown. Definition: One of the three antagonists (or maybe protagonists?) predators in "Alien vs. Predator". The one that fights an alien for several minutes and manages to capture it with a net only to have his brains blown out by it; the second predator that dies in the movie. Origin: My most honest guess is that the mask design of this predator reminds of celtic culture. Celts were a linguistic entity in Europe before Roman Empire, ca 800-450 B.C. For more info you'll have to look up "Celts" and their culture on wiki or in a history book. Definition: A newborn alien that has just popped out of someones chest. Origin: Aliens do burst through rib cage when they "exit" the human body. Definition: One of the three antagonists (or maybe protagonists?) predators in "Alien vs. Predator". The first predator to die in the movie, killed by an alien right after kicking Alexa. Origin: The long blade that this predator pulls out on his right arm can be thought of as a chopper, that he "chopps" people with. Definition: The predator that is strapped to the totem in "Predators", the one that fights with another predator near the end of the film. Origin: Unlike the rest of the predators in the film, this one shares a very similar design with the predators from the first two films. Definition: "Spear" that is used by the main antagonist predator in "Predator 2". Origin: I assume that "combi" is a reference to "combat" and "stick" is, well, a stick. Definition: The "alien"-creature that appears in the very end of Prometheus. Also referred to as "Proto(-)alien/Proto(-)xeno". Origin: The pointy back of its head has shape like that of a hat of a real-life deacon. Definition: The abandoned alien ship in "Alien", the one in which Kane gets a spider-like creature attached to his face. Origin: It's what looks to be an abandoned alien space ship, and one of the real-life definitions of the word "derelict" is conveniently "abandoned ship". Definition: The "dics" that the main antagonist predator uses to fight Harrigan with in their last fight. Also referred to as "Smart(-)disc". Origin: Well, the thing does look like some form of disc, doesn't it? Definition: Extended Universe. Everything in the franchise that is beyond movies, such as comics, games, books, etc. Origin: Sort of speaks for itself. Definition: When an alien impregnates creatures directly throat-to-throat with more aliens. Origin: What Chet/Predalien/Predxeno does in "Aliens vs Predator: Requiem" to pregnant women, meaning when it sort of "barfs" small aliens into them. The subject is highly debated regarding whether this function is inherited by all aliens or is simply a genetic mutation bound to Chet/Predalien/Predxeno. Definition: The process of humans "transforming" into alien eggs. Origin: In the deleted scene of "Alien" (though it is part of the film in Director's Cut), Ripley finds her crew to be attahced to walls and covered with some sort of slime. It is believed that the alien wanted them to, by some complicated biological/chemical process, sort of "morph" into eggs. Definition: Little creatures with eight leggs/fingers and a tail. These are the things that "injest" aliens into human bodies. Origin: They attach themselves to their victims via face, in order to "plant" an alien. Definition: One of the three antagonists predators in "Predators", the one that fights yakuza guy towards the end of the film. Origin: He uses a sort of flying little "robot" to keep track of things. The robot is called "Predator Falcon", hence "Falconer". Definition: The alien from "Alien vs. Predator" that kills two predators. Origin: After been captured in a net by a predator the net has made scars in its scin that resemble a grid pattern. Definition: The "snake-thinny" that attacks and kills Millburn in "Prometheus". Origin: Unknown. Definition: The dead, giant creature seen in "Alien", in the scene where Lambert, Dallas and Kane find its remains. 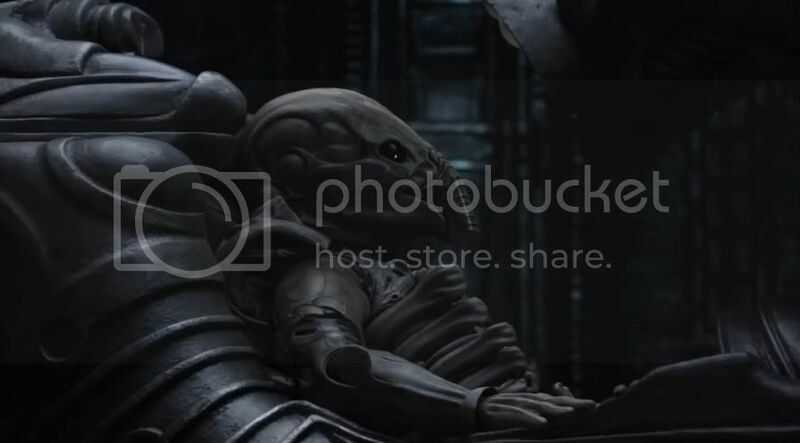 This is also postulated to be the creature in "Prometheus", referred to as "Engineer". Origin: It is believed that the creature in "Alien" was the jockey of a crashed alien ship, known as the "Derelict". Definition: the main alien in "Alien", the one that kills the crew of "Nostromo" (except Ripley). Origin: It pops out of Kane's chest while the crew are having a meal. Definition: A weapon that the main predator antagonist/protagonist is using to kill aliens with in "Aliens vs Predator: Requiem". Upon been attached to a ceiling or wall it shoots laser beams to the opposite wall of the corridor/room that, when passed through, cuts through (alien) tissue. Origin: The weapon is shooting laser beams and can be attached to a wall or ceiling and activated when someone tries to pass by. Definition: An alien design formed after Kane's Son (the alien from the 1979 "Alien" film) from the upcaming game "Aliens: Colonial Marines". Origin: It is often agreed upon that the distinct tactic of Kane's Son was to lurk in the dark and wait for its prey. Definition: One of three main antagonists predators in "Predators", the one that fights another predator and faces Royce in the end. Origin: The "eye sockets" on this predator's mask seem to be very black and quickly captures the eye. Definition: The human/alien hybrid we see in the last act of "Alien: Resurrection", the one that gets his body "decompressed" and sucked out in space at the end of the film. Origin: I'm guessing, and bare with me, since this is a guess, but it's because this monster is something completely new to the franchise and since it gets literally born in front of our eyes, here you go. Definition: The mix of alien and predator in both Alien vs Predator films, the one that pops out of a predator chest in the end of "Alien vs. Predator" and the one that predators fight in "Aliens vs Predator: Requiem". Also referred to as "Chet". Origin: Half an alien/xeno, half a pred. Definition: A fan-made script of the next predator film. Origin: http://www.avpgalaxy.net/forum/index.php?topic=20274.0. Definition: The wild "dog"-like creatures that attack humans in "Predators". Origin: "A hound is a type of dog that assists hunters by tracking or chasing the animal being hunted" - Wiki. Hence, predator hounds. Because that's what they are, kind of. Definition: The "alien"-creature that appears in the very end of Prometheus. Also referred to as "Deacon". Origin: It is a common belief that this creature is some sort of an early-evolution prototype of the all-feared and beloved alien we know. Definition: The main predator antagonist in "Predator 2", the one that Harrigan fights in the end of the movie. Origin: What Harrigan calls the predator in the film. Definition: An alien concept from "Aliens: Colonial Marines". The one that has green glowing tubes on its back and spits acid at folks from a distance. Origin: It spits acid. Definition: The main predator antagonist/protagonist in "Aliens vs. Predator: Requiem", the one that fights all the aliens and kills Chet in the end. Origin: Lone wolf? I guess. I'm a looong way from finished. I will be updating this thread every once in a while when I got some sparetime on my hands. I will greatly appreciate any suggestions and/or corrections to make this dictionary as easy as possible to use. You may also have noted that origins of many words are "unknown". That is true, I don't know why Chopper is "Chopper" for example. Is it a reference to "Predator", when Dutch screams "Get to da chopper!"? I allways thought that, but I know I'm wrong. Or maybe is it because he "chopps" things? In short, I'd be very happy to get some info, so feel free to post any. Nice thread. I won't mind to see this thread sticky. Origin: I guess it looks like he rage a lot. A group of literary works that are generally accepted as representing a field. Origin: My most honest guess is that the mask design of this predator reminds of celtic culture. Celts were a linguistic entity in Europe before Roman Empire, ca 800-450 B.C. For more info you'll have to look up "Celts" and their culture on wiki or in a history book. Let me guess... uh... production nickname. Filmmakers thought the pointy back of the head resembled a Deacon's hat. Origin: Well, the thing does look like some form of disc, doesn't it? OMG, the work this must take to do. I sure hope this person is looking at ALL threads from 2006 and up, those early years should definitely reveal some definitions and lulz. Wolfctopus -- fictional monstrous deity, parody of the Wolf Predator in Aliens Vs. Predator: Requiem and its fans. Origin: Member OmegaZilla posted a crudely made image edit portraying an octopus with the Wolf Predator's head. Link to original post. Space Tapir demands an entry. Space Tapir. Love child of Cvalda and Bat Chain Puller. Cvalda did all the work conceiving the child. I just took her egg and fertilized it into a Youtube sensation. Fictional parody of the Space Jockey suit in Prometheus, with its head and a tapir body, due to the suit's resemblance to this animal. Origin: its first mention is unknown, but it has spread thanks to member Cvalda and her photoshop works depicting the creature, which inspired other users. Prometheans should be added as it should mean that new members after Prometheus appeared started topics that made no sense and also who contributed nothing at all in the Prometheus board, and instead turned into a shitfest. Cvalda just loves him to death. But I am no stranger to being burned by women. Actually, the term was semi-coined by wmmvrrvrrmm when the first full-length trailer hit back in March. He derided the suit as a "tapir" and I ran with it, making it "Space Tapir". Revised: Fictional parody of the Space Jockey suit in Prometheus, with its head and a tapir body, due to the suit's resemblance to this animal. Origin: its first mention goes back to member wmmvrrvrrmm, who defined the suit as 'a thing with a face like a tapir'. It has spread thanks to member Cvalda and her photoshop works depicting the creature.